My kids tried this one and they were not a fan of it. They like a lot of the other flavours but this one was definitely not a hit. Way too salty for the kids and gives an upset yummy. Makes the kids hungry again in an hour of eating iit. So not filling. 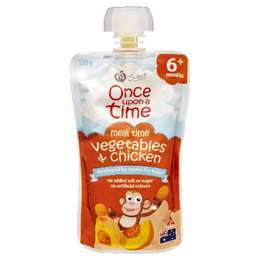 This product is rated 6 months plus but it is by far the runniest infant food product we have tried. Very watery. I would expect it to be thicker given the age demographic. With my first I steamed and cooked away for solids introduction, with my second I have far less time. These are convenient. I know that they’re healthy and he is getting a mix of foods to try. A lot less work for me in the long run. How would you rate Once Upon A Time 6 Months Vegetable & Chicken?